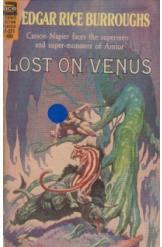 Lost on Venus Edgar Rice Burroughs Sci Fi. Book is in good condition, all pages intact. Trapped on the planet Venus, Carson Napier struggles against beasts, supermen, and many other hazards in order to fulfill his promise to rescue the planet's loveliest princess.